Lightly grease a 9×13 baking pan and set aside. Toss together the chopped potatoes, jalapenos, garlic, and onions in the olive oil. Season with the paprika and salt and pepper. Roast the vegetables until fork tender, about 40 minutes. Allow vegetables to cool completely before proceeding. 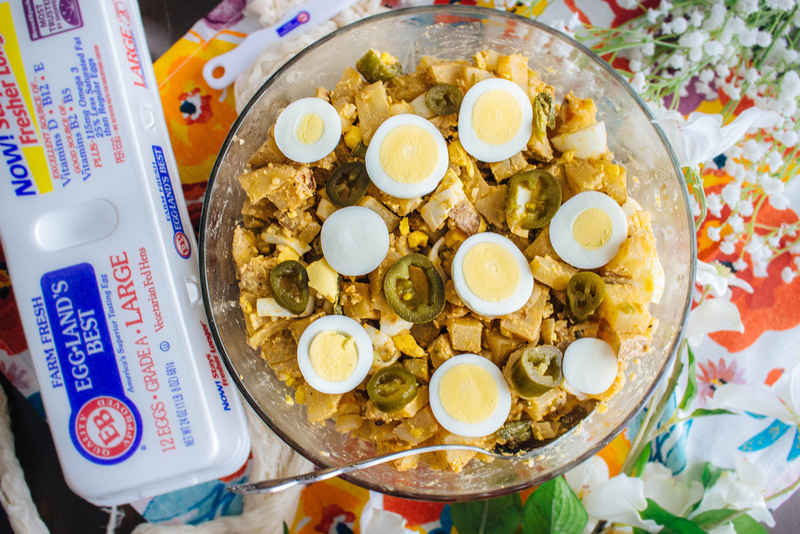 In a large mixing bowl, stir together the chopped hard boiled eggs, pickle relish, mayonnaise, garlic powder, celery salt, jalapeno, mustard, and sriracha. Add in the cooled vegetables and fold carefully until combined. Season with salt and pepper to taste. Transfer potato salad to an airtight container and store in the fridge to cool before serving..